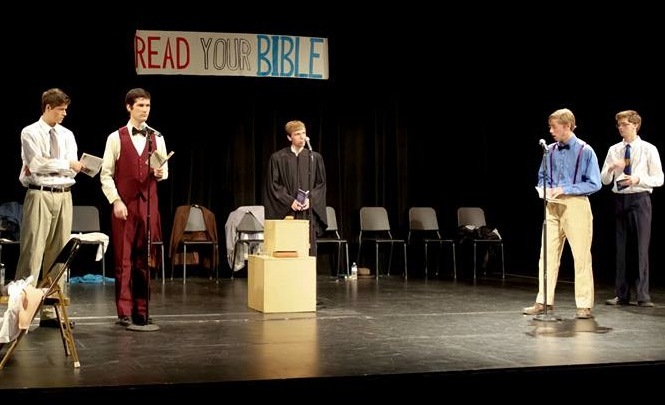 This weekend, the Spring Arbor drama department presented a reader’s theater production of Inherit the Wind. The play, written in 1955, uses the 1925 Scopes “Monkey Trial” as a vehicle to explore certainty, rationalism, doubt, science, faith, celebrity, and cynicism. Following the play, there was a panel discussion with five of my colleagues. The panel featured a communication professor (who explored the vast differences between the play and the real trial — read Edward Larson’s Summer for the Gods for more), a philosopher, a theologian, a chemist, and a microbiologist. It was a fascinating presentation. They explored the complexities of the theological explanations of creation and the purposes of Genesis. They talked about the challenges of crafting hybrid positions. They explored the traditions of interpretation from early church fathers to the present. They discussed the age of the universe (related to automobile decay). They considered the converging patterns coming from various strands of science that are consonant with Darwin’s major themes. They collectively stated their faith in the God of Creation. It was a great celebration of the best of Christian Higher Education. It was interdisciplinary, careful, faithful, and most importantly, was not afraid of leaving listeners wrestling with the complexity of life’s major questions.This exercise in liberal arts stood in stark contract to four aspects of the play itself, which I want to unpack a bit. First, a minor character in the play is E.K. Hornbeck, a writer for the Baltimore Sun, who treats the whole thing as a farce. It’s just endless entertainment and his cynicism is unquenchable. There is nothing he respects and no one he takes seriously. Based on H.L. Menken, who had his own unique brand of attack, the journalist (played in the movie by a nearly unlikable Gene Kelly) represents our modern dismissal of authenticity. It’s a belief that everyone’s got an angle and can’t possible believe what they’re saying. Second, there is a scene at the start of the play where people are gathering in an almost carnival setting. They are using the coming arrival of Matthew Harrison Brady (William Jennings Bryan) as a moment of great celebration. A great celebrity is coming to their little town and it’s become an EVENT. Critical thinking goes out the window because Brady is in town. His power and might is all that is needed. Henry Drummond (Clarence Darrow) gets to be the defender of free thinking but he’s pretty abusive in doing so. Today we need a quiet celebration of rationality that neither demonizes thought nor lionizes it. Third, there is the banner hanging in the courthouse (seen in the picture above): READ YOUR BIBLE. The banner, as well as the local pastor (who is somehow even less likable than Hornbeck), seem to suggest that anyone who doesn’t agree with their position is morally flawed and more or less hopeless. There’s a fascinating speech where the pastor goes too far in his rhetorical flourish and thankfully gets called down by Brady. We’d be in far better shape as a society if we could avoid such demonization and if today’s celebrities could denounce it when it happens. Finally, I was struck with the reason for the title of the play. Brady quotes Proverbs 11:29: “He who troubles his own house inherits the wind and the foolish will be servant to the wise.” The playwrights intend the “troubling the house” to be calling out McCarthy and colleagues in the 1950s. But I see it playing out today within dynamics of the house of faith. When we spend all our energies fighting internal battles, we accomplish little. It’s carnival and cynicism and demonization and fear. And we look foolish. I’ve written before about the tendency of Facebook to balkanize arguments. But Twitter is the vehicle for troubling the house. It’s fast and allows no complexity. It invites bandwagon effects as people jump to one side or another of the twitter-fight. At the end of a day or two, either there is an attempt to quiet the tension or to simply file it away and move on to the next event. I’m not sure exactly who Solomon thinks are the “wise” who will be served. But I’m thinking that my colleagues on the panel come pretty close. They were honest, had authenticity, heard each other, and modeled what faithful presence means in the midst of others. A Christian church that could do that on a regular basis will impact the world. Not through carnivals and celebrities and catcalls. But through wrestling with real ideas, loving people who think differently, and taking the risk of being authentic. No amount of cynicism can stand against it.